Astronomy is a very popular function of the Petroglyphs site. We're in an area with almost no light pollution, low horizons all the way around, and some on-site telescopes. We have several astronomy nights each year, including an event lasting three nights where astronomers are welcome to come and set up their equipment on-site for overnight viewing. We are also planning on having solar glasses on hand for sunspot viewing, and hope to develop more solar programs in the future. You can see the page in progress here. Our area is one of the best in the country for stargazing. We're in a zone where you can normally see stars of magnitude 6.8 (explained here). If you don't want to look it up, that means that from our location you can see so many stars that it can be hard to pick out the constellations! The Milky Way is easily visible, and most of the fine details can be seen with the naked eye. Full Moon viewing nights, with a moon globe inside for additional study. "Star Track" Constellation nights, with information about the constellations, how to find them, and Native American and other legends about the constellations. We have green "star-pointer" lasers on hand to make finding them easier. Children (and adults, if they wish) can do glow-in-the-dark Native American constellation pages to take home. "Starry Night, Prairie Night", where astronomers come and set up their equipment and will allow visitors to look as well. This may be expanded to include an astronomy "swap meet", where people can buy and sell used telescopes and parts. We are also talking with some astronomers about conducting informal classes during the evening about equipment, setup, and other topics. We also have a globe of Mars on hand, which was used during the close-approach of August, 2003. We had over 100 visitors come out to see it through our telescopes, and had 8 visitors come out at 4:00 in the morning to see it at the absolute closest approach! We also did a "Blue Moon" night in July of 2004, which was well-attended but unfortunately the clouds didn't cooperate. We are always adding new information sheets for our visitors, including activity pages for Mars and the Moon; the glow-in-the-dark constellation pages; how to tell time by the Big Dipper; what a "blue moon" actually is; Native American names for the full moons; and anything else we can come up with that we think might be of interest. We have two telescopes at present. One is a Meade ETX-125AT Maksutov-Cassegrain (5" aperture, 1900mm focal length, f/15) and the other is a Celestron refractor (60mm lens, 600mm focal length, f/10). We also have binoculars and a spotting scope mounted on tripods, and hope to have a camera system hooked up to the telescopes soon so we can put the images on a screen instead of letting one person look at a time. A website that lists "dark sky" locations around the country. We're included in the list for Minnesota. And finally, if you'd like to know what the probable viewing conditions will be before you make the drive out here, here's the "Clear Sky Clock" viewing forecast for the Petroglyphs area. As a rule, for the "Sky" section, the darker the block, the better the viewing conditions. 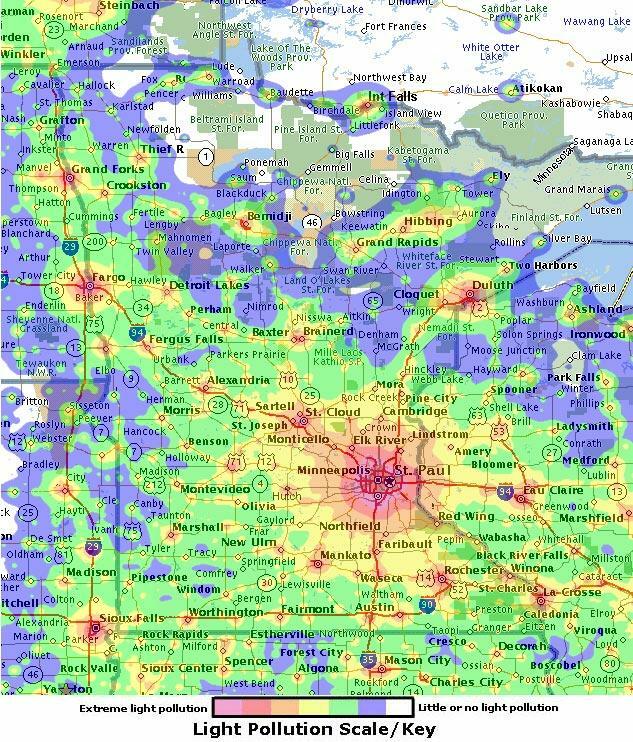 Craig Cotner's Light Pollution Map of Minnesota (we're located under the "e" in Comfrey in the lower left). And here are some information/actiity sheets we've worked up for children and adults. These are in PDF format.